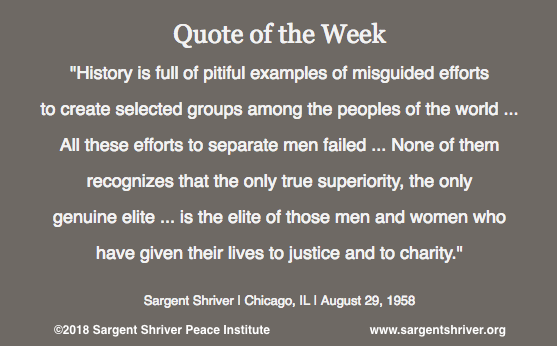 Sargent Shriver Peace Institute - "The Only Genuine Elite"
Our Quote of the Week reveals some fundamental values of Sargent Shriver's that we must continue to uphold today: that segregating human beings by race, class, religion, or other identity-based characteristics is dangerous and unjust; and that service to others is a precious and valuable human characteristic to cultivate. Delivering the keynote speech at the first National Catholic Conference for Interracial Justice 60 years ago this week, Sargent Shriver addressed, as the title of his speech indicates, the roots of racism. He made the point that even if we were to rid our political and administrative systems of discrimination, rooting out racism would still be difficult. Referring to racism as a "disease," he continued that it was an "affliction of the spirit, of the soul of man, rather than a disease of his conscious, intellectual life." He urged the convention delegates to join him in dedicating themselves to healing the wounds of racism and to creating, as he called it, a "'Community of the Free' -- a new and even better 'Home for the Brave.'" In 2018, Sargent Shriver's words about the dangers of racism and the importance of justice and service are as important as ever. Whether on the streets of our communities, in the news headlines, or over social media, we have painful reminders that racism, religious intolerance, and white supremacy are alive and well in the US. We must work together to create an environment where service to others is cherished, justice for all is expected and achieved, and hatred is not tolerated.